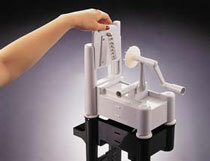 The shredder blade measures 1/8″, or 3mm, in thickness and produces long spaghetti-like spiral strands. 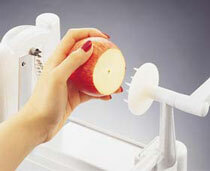 The chipper blade measures 1/4″, or 5mm, in thickness and produces long, thick spiral strands. 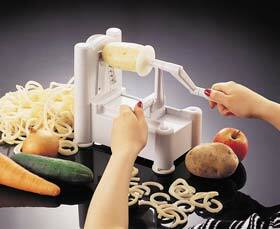 The flat blade measures 1/8″, or 3mm, and produces long ribbon-like strands. 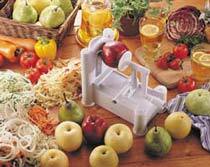 Your vegetable or fruit can measure up to 10″ long and 7″ thick, and must be at least 1/2″ thick in diameter. 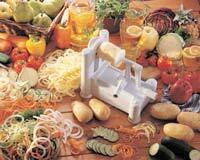 Suggestions of vegetables and fruits to use are zucchini, carrots, cucumbers, sweet potatoes and apples. 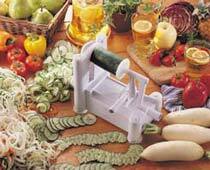 You can make long ribbons of cucumber and radishes for salads, apple spirals for apple slaw, sweet potatoes for curly sweet potato fries or use the straight blade for sweet potato chips! 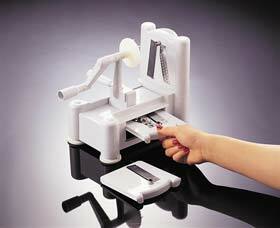 Secure slicer to counter by pressing on suction feet. Insert your blade of choice. 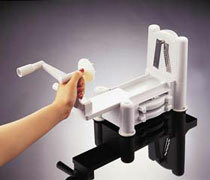 Push or pull the food holder to accommodate your chosen fruit or vegetable. 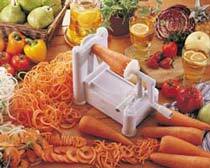 Secure your food on the circular corer and gently press into prongs on the opposite end.